The earliest kitchens consisted of an open fire with a cauldron and – if you were really well-off – a spit for roasting meats. Things certainly have evolved since then, and the array of high-tech kitchen equipment available to the modern homeowner can be downright overwhelming. We’ve gathered some of the most popular trends to help you navigate the choices when designing and building your dream kitchen. 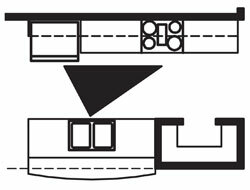 There are literally thousands of different ways to lay out a kitchen, but most designs are a variation of one of four basic arrangements: corridor, peninsula, L-shaped, and U-shaped. The National Kitchen & Bath Association developed kitchen planning guidelines to illustrate good planning practices that consider the needs of a range of users and make the kitchen more usable and efficient. 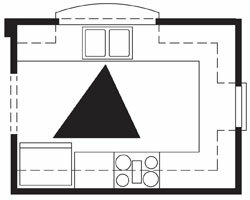 Most people are familiar with the concept of the work triangle, which is the shape made by drawing a line between the stove, sink, and refrigerator. The NKBA suggests that for maximum efficiency the total length of the work triangle should not be longer than 26 feet, and no one side of the triangle should be less than 4 feet or greater than 9 feet. Every kitchen will have at least one work triangle. A growing trend in kitchen design is to create stations or zones which may create a secondary work triangle by adding a secondary prep sink or cooking appliance such as a wall oven. Zones or stations allow two or more cooks to work in the kitchen without getting in each other’s way. Adding a prep sink to an island allows one person to peel and chop ingredients for a meal (prep zone) while another person cooks (cooking zone) and a third person washes dishes (clean up zone). Even though they are all in the same room and able to interact with one another, each has ample space to work without interference which minimizes accidents and creates a more pleasant cooking experience for all. Non-cooking zones may also be added to the kitchen. For example, many modern kitchens incorporate a desk space for a computer. By locating the desk in its own zone children can use the computer to do homework while their parents prepare dinner, and the computer is handy for the chef for looking up a favorite recipe online. Socialization zones are also popular, and most commonly consist of a breakfast nook with table and chairs or barstools at a countertop that allow other family members or guests to chat easily with the cook without intruding into the work zone. Many home plans offer a keeping or hearth room adjacent to the kitchen which allows larger groups to socialize in comfort. For families with several children or those who entertain frequently this arrangement is ideal for keeping everyone close without crowding the chef. Every homeowner wants plenty of storage for utensils, dishes, cookware and food. Well-planned kitchen organization is a continuation of the zone concept. To save steps and make the kitchen efficient it’s best to think about where items will be used when deciding how and where to store them. For example, pots and pans should be stored near the stove, knives and cutting boards should be kept in the prep area, and cleaning supplies make most sense near the sink. You can go beyond these generalities to organize your kitchen to meet your family’s needs. If you have small children, consider adding an under-counter refrigerator drawer to hold snacks and drinks just for them at a height they can easily reach. You may want to store unbreakable plates and cups in a lower cabinet or drawer for them as well. A drawer next to the stove with spice jar inserts keeps frequently-used spices accessible when cooking. Vertical dividers in tall cabinets are great for storing cookie sheets and muffin tins near the oven, but have you considered adding another vertical divider near the serving area for storing large platters and serving trays? Ultimately you need to think of how you will use your kitchen and plan your storage accordingly. Cabinet manufacturers have a wide array of ingenious storage solutions that make the most of every inch of space in the kitchen and it is well worth your time to shop around and find the items that work best in your space and for your lifestyle. The trend to have the kitchen open to other rooms in the home shows no sign of waning. While most homeowners prefer this arrangement it does require some design sensitivity to keep messes out of sight and ensure the cook is able to function effectively without constantly having to deal with foot traffic through the work area. These problems can be avoided through the clever use of visual and physical boundaries. Islands and peninsulas are ideal for creating a subtle barrier between the work area of the kitchen and other zones. This division can be enhanced further by making the outer side higher, which sometimes has the added benefit of creating a serving bar. If the sink or cook top is located in the island or peninsula, the higher side also helps hide kitchen messes from the other rooms. Another way to visually separate the kitchen without physically closing it off is to vary the ceiling height from the adjoining rooms or use a decorative ceiling treatment. These act as visual cues to define the kitchen without closing it in. Using decorative columns instead of walls has the same effect. One unintended side effect of an open kitchen arrangement is that cooking smells can more easily dissipate throughout the house. This can be avoided by using a good ventilation system such as a range hood. Newer versions allow the motor to be positioned in the duct or on the roof, cutting the noise level down in the kitchen considerably. Another option is to install a venting skylight which uses the chimney effect to ventilate odors to the outside and has the added benefit of allowing natural light into the room. Technology continues to advance at a rapid pace and kitchen appliances are no exception. If you have not shopped for appliances recently you may be surprised at the variety of the offerings available. All appliance manufacturers are striving to make their appliances functional and energy efficient. Newer refrigerators are up to ten times more energy efficient than those made as recently as ten years ago, and dishwashers offer options such as steam cleaning which uses far less water than older models. New technologies for cooking such as induction cook tops and speed cook ovens are becoming increasingly popular. They allow you to cook much faster using less energy than traditional methods. Specialty appliances such as built-in steamers, grills, ice makers and wine coolers are increasing in popularity as well. If energy efficiency is a high priority, look for appliances with the Energy Star label. As with organization, it is best to think of your needs and plan accordingly when selecting appliances. Do some research online and shop around to see all the options before you make a decision. The most expensive is not always the best choice, but you will want to keep resale value in mind and choose appliances that are in line with the rest of your home. In other words, if you are building a luxury home don’t install bottom-of-the-line appliances - even if you rarely cook - because if you decide to sell the home later they will likely reduce your home’s value. By the same token, if you are building a modest home it may not pay off in the long run to install a $10,000 commercial-grade stove. If you truly love to cook you may decide to install one anyway - and will enjoy it while you live in the home – just be aware that you may not recoup the value of the investment should you decide to sell. Stainless steel continues to be popular but there are signs that it may finally be on its way out as the finish of choice. Sales of appliances in black and bisque are on the rise, and many homeowners are choosing to completely hide some appliances behind panels that blend with the cabinetry. Today’s kitchens are much more personalized than those of the past. Because they are open to adjoining spaces most homeowners choose their cabinet and countertop colors based on the decor of the rest of their home. Cabinets set the tone for the room and are available in every style from country to modern. Though numerous painted and stained finishes are available, most people choose neutral colors for the cabinets and add brighter accents in places that are more easily changed such as wall color, cabinet knobs, and accessories. 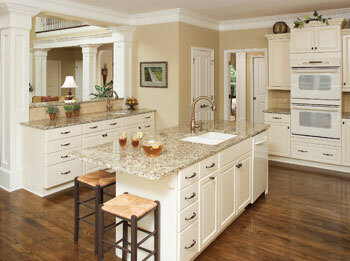 Browns and creams continue to be popular and gray is the “new neutral” for contemporary kitchens. The hottest accent colors are reds, oranges, pinks, and violets; all are best used in small doses and mixed with warm neutrals. The trend of making cabinets look like traditional furniture pieces such as armoires continues to grow. This type of design helps to integrate the kitchen with the adjacent spaces. Disguising the refrigerator and dishwasher with panels that match the rest of the cabinetry helps to downplay those items and lets them blend into the design as a whole. Adding turned legs or bun feet to lower cabinets and crown molding to upper cabinets also reinforces the furniture look. Granite countertops are still hot, but solid surface and engineered quartz are gaining in popularity, as are alternative surfaces such as concrete and composites made from recycled paper or glass. Some man-made surfaces have added features such as Microban® which is an antibacterial agent incorporated into the material that never wears off. Other materials allow for integrated sinks and drain boards that further allow you to customize the space. The bottom line: the design options for your new kitchen are nearly endless and allow you to express your personality and style while also being functional and energy-efficient. Researching and planning ahead before you build will ensure that your dream kitchen provides years of value and enjoyment. Most people are familiar with the work triangle, which is formed by drawing a line between the stove, sink, and refrigerator in your kitchen. 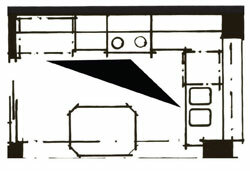 While there is an endless array of kitchen layouts, most are a variation of one of the four simple shapes shown below. Corridor kitchens are efficient for the chef as everything can be reached in just a few steps. Depending on the length of the kitchen, storage and countertop space may be less than in other layouts. Peninsulas are often open to another room, creating a sense of spaciousness in the kitchen. Often they will have a higher counter height on the open side to create a snack or serving bar. 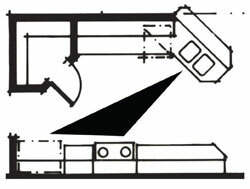 The L-shaped kitchen is one of the most common. By varying the length of the “L” you can increase counter and storage space. Often the “L” shape is accompanied by an island, creating even more work space. 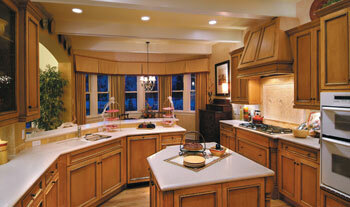 U-shaped kitchens wrap around you on three sides and offer plenty of countertop space and storage. If the room is large enough an island can be added in the center.